BLAEU - Macedonia, Epirus et Achaia. BLAEU, W. - Macedonia, Epirus et Achaia. Macedonia, Epirus et Achaia. 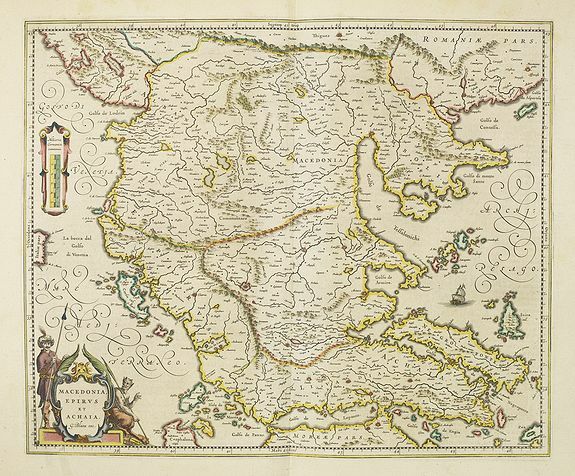 - BLAEU, W.
Title : Macedonia, Epirus et Achaia.. Size : 16.1 x 19.3 inches. / 41.0 x 49.0 cm. Description :Nice map of northern Greece with the southern parts of present day Macedonia and Albania. Includes the region of Athens. Strapwork title cartouche and Spanish text on verso. The atlas Maior was printed only in small numbers, the Spanish text edition is extremely rare. The Spanish edition was never completed. When fire destroyed the Blaeu printing house at the Gravenstraat in Amsterdam in 1672, the final volume was in the press and consequently lost. The Atlas Maior is the epitome of decades of achievement by the Blaeu family. Published in five languages (Latin, Dutch, French, German and Spanish) from 1662, it grew to eleven or twelve volumes in its most comprehensive editions, and was as Koeman observes a "costly atlas . . . Exclusively designed for those members of the patriciate who could command both the material and intellectual resources that were needed to buy and appreciate it". Joan's father, Willem Blaeu, commenced publication of his new world atlas, the Theatrum Orbis Terrarum, also referred to as the Atlas Novus, initially in two volumes, published in four languages. After succeeding his father, Joan Blaeu progressively expanded the Atlas Novus to six volumes by 1655, and this formed the first half the Atlas Maior. The Atlas Mayor (the Spanish edition of the Atlas Maior) is the rarest edition of what De la Fontaine Verwey called "the greatest and finest atlas ever published". Van der Krogt locates only four institutional copies, printed in 1672 or earlier, with at least this degree of completeness. According to ABPC, only three copies including the present one have appeared at auction in the last thirty years. Koeman I, BL 60A (pp. 271-291), cf. A. Berkhemer, 'De Spaanse Atlas Mayor van Blaeu: nieuwe gegevens', in Caert-Thresoor 16 (1997) 3, pp. 71-76, H. De la Fontaine Verwey, The 'Spanish Blaeu,' in Quaerendo 11 (1981), pp. 83-94. Condition : Very good condition, wide margins. Some very light age-toning of the paper. On ply-paper. Several town spots heightened in gold. The map originally has French text on the verso and is pasted on a page with Spanish text.